Trenčín  is an old town in Western Slovakia. It is a beautiful old historic city, with a population of over 50,000. Trenčín is the main city of the western part of Slovakia called “Považie”. It lies on the longest Slovak river called the “Váh”. 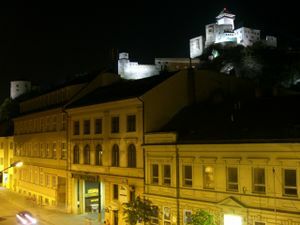 Because of its importance and beauty, Trencin is called “the pearl of Povazie”. Trenčín is a peaceful city with a beautiful historical centre and several suburbs. The Trenčín hockey team belongs to the best of Slovak hockey clubs, and its soccer team is in the top league as well. Generally, Trenčín is one of the wealthiest cities in Slovakia with low unemployment and quite a high standard of living. Because of its position between the mountain chains, it is likely to have windy weather. Winters are quite long, and summers are not the warmest when compared to the Slovak average temperatures. Because of new investors and a wide number of new construction projects these days, Trenčín is redeveloping itself into a new regional tourist centre in Slovakia. Currently, Trencin has suffered a series of setbacks. High unemployment, and a bankrupt city has led to a mainly under-served services. In fact, a city pool was built in 2012 which somehow lacked even plumbing and remains an eyesore to the area. Unfortunately, the town is not near to being a wealthy city unless you count wealthy residents which there are plenty. The nearest international airports are Bratislava (1 hour by car), Brno and Vienna, both about 2 hours) by car. The Trencin airport currently does not serve any scheduled or private traffic and is used for huge Pohoda Festival which takes places annually every July and host a range of international stars and local music bands and artists. Trenčín is situated in the north-west of Slovakia, 120 kilometres north of Bratislava, close to the border with the Czech Republic. The main highway from Bratislava to Kosice, which is in some parts still in progress, has a direct exit to the centre of Trenčín. When taking the D1 highway from Bratislava it shouldn't be more than a one hour trip. Traveling by car to Kosice from Trenčín takes about four hours, while Banska Bystrica, which is in the middle of Slovakia, is two hours drive away. You can take one of the frequent Intercity trains from Bratislava to Trenčín, as it is on the national main line. It takes about one hour and 5 minutes to reach Trencin from Bratislava. The trip further east to Kosice takes from 3.5 to 4.5 hours depending on which kind of train you take. Because of the location of Trenčín in relation to other surrounding destinations, it has many buses going through it. The trip to Bratislava from Trenčín takes about two hours (the train is a better option), to Banska Bystrica takes about three hours (a bus is the fastest way) and if you want to travel to Kosice, take the train. There is a number of buses going further to destinations such as Prague, Brno, Vienna and even London. The main station for local buses is across the road from the train station. Tickets can be bought on the bus. Although river Vah passes through the centre of Trencin town, there is currently no scheduled river boat services. Locals swim in the river during the summer at the 'Ostrov' part. The center is a pedestrian area. Its very small and you can easily walk from one side to another in a few minutes. Trenčín has a rather good public transportation system although to a smaller boroughs goes is at most one bus per hour. Bus drivers sell tickets, but you can only use cash. Ticket is valid only for one journey without change and costs 0,60 €. For schedules and map of routes see imhd.sk (also in english). Trenčín castle is very old. There is unique Roman inscription from the year 179 when the Roman legions led by Marcus Aurelius have winter settlement named Laugaricio there. It's written on the castle rock and it's freely accessible from within the Hotel Tatra. Beckov Castle is a local castle ruin. It is easily reachable by bike from Trenčín. The Hradza is a levee along the Vah river. The path is used by walkers, bikers, and rollerbladers. The Brezina is forest which runs around the south-east of Trenčín just two minutes by walk from the city centre. It contains number of very nice, quiet and safe trails also good for biking. There is possibility to go canoeing on the Vah river during the Summer season. You can also lend canoe at the "Ostrov". Cinemax - ZOC MAX, it is a complex consisted of four cinemas in one shopping centre called Max on the Stefanikova street. Metro – Cinema in the heart of the city on the main square. They use to play non-commercial movies from different countries worldwide. Municipal gallery, Mierové námestie 22. Gallery hosts naive and professional artists from Trencin region. Trenčín Museum, Mierové námestie 46. Museum is situated just at the beginning of the main square coming from hotel Tatra by the left hand. 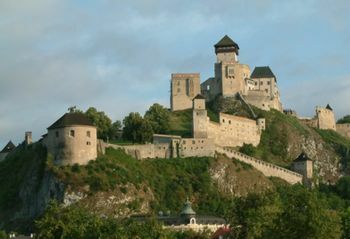 It is generally presenting the history of Trencin and has nice exposition of animals as well. Music undertakings often provided. Pohoda Music Festival  This is the big event that everyone looks forward to. July. Fashion was a synonym to city Trenčín in the past, it was called “Trenčín the town of fashion”, as it hosted national fashion exhibitions due to its rich textile heritage and large textile companies such as Ozeta were based here. While this may have been true in the past, trencin fashion is more of big brands and less so of domestic brands. This town has many nice small shops and big shopping malls. Small traditional and independent shops are all located in the town centre. A lot of these shops create a nice look to the square. There are also fantastic Christmas market stalls in December. Both shopping and sightseeing could be done in the town centre if you are short on of time. Max –gen. M.R. Štefánika 426, there are a lot of cafés and small shops, located 1km from the train and bus station. Baumax, Big Boxes and Tesco - Električná 911 01 Trenčín, are on the other side of the town from MAX. There are some good shops, and also some cheap ones. however if you want quality then go to the Peace Square. Južanka Shopping Centre – it is located in the residetial part of town which is called “Juh”. This is a local centre, small and not as big as MAX. Laugaricio- the new and largest shopping centrum. There are a lot of sport shops and there are also shops with clothes and a lot of cafés and restaurants and overall most of your needs will be catered for. In Trenčín there are many good places where you can eat, there are some really good fast foods in the town centre, and you can have their national specialties in a roll, such as “Cigánska pečienka”, which pork roast on the split in the roll. Basta this restaurant is located on the place called “Ostrov (island)” and only this one restaurant is opened all day and all night. Giacomo Pizzeria typical Italian pizza with everything what belongs to it, they are also serving pasta and salads. This pizzeria is very close to Restaurant U Sanera. Retro Restaurant Very clean, good service, they have very good meals and the prices are quite good, also every weekend there's live music. Although Trenčín is a small city, there are many places where you can drink. The festivities begin on Friday and Saturday night, when many people go to the city centre for entertainment. Steps Pub and Cocktail Bar – http:/www.stepspub.com/ located near the town tower pub for “higher class” hockey players and other people like this, no fee during weekends, best sound and light system, drinks are quite expensive, but nobody under 18. Cinema Movies Club – very good place for entertainment on Friday and Saturday, during the week it is the restaurant. No entrance fee to disco, drinks are cheap, and also society is middle class. One big Tea room is located on the Mierové Square opposite to the Church, which is also a shop with tea stuff. There is one very good tea – Tea of Old Touaregs, green tea made from gun powder. Čajovňa Jaipur is an oriental themed tea-house on the other side of the clocktower near the tourist info center on Hviezdoslavova 8. It has a pleasant atmosphere and friendly staff, delicious tea, non-alcoholic cocktails and sheesha pipes. They often have live music, and there is a terrace for pleasant evenings. Penzion u Svorada, Palackého 84/4, ☎ ++421 32 7430 332, . Private economy rooms adjoined to a student building located centrally. From €20 for a twin bed simple room, to €30 for a twin room with a fridge and en-suite shower edit. Ostrov camping , basic camping situated near the lake Vah, swimming pool and sport hall are close to that camp. It's good for anglers, fishermen, and people with boats and water scooters. Hotel Pod hradom*** , Matúšova ulica 12/68 situated behind the “Mierove Square” it is close to the castle. Hotel Elizabeth ( Formerly Hotel Tatra) ****, M. R. Štefánika 2, . National Monument, hotel was built in the year 1900, hotel provides high quality service, lovely accommodation, excellent bars and restaurants. The hotel is also famous for the old inscription message on the walls of the castle. The message was left Roman forces in 179 AD and is one of the oldest mentions of the City which was than names Laugaricio. It is also the northern-most point of where Roman leagions stayed in that period in the central Europe area. The hotel is by far the best hotel in town and is frequented by high profile local guests and most overseas and business travelers. Grand Hotel***, Palackého 24 close to the "Peace Square"
Internetova kaviaren, Braneckého 6; Hours: Monday - Friday 9 AM - 10 PM, 12 PM - 10 PM. Hajex Cafe, Palackého 17; Hours: Monday - Friday: 10 AM - 9 PM, Saturday: Closed, Sunday: 3 PM - 9 PM. Trencin is quite a silent town it is very safe by European and American standards; there is not so much crime like in other parts of world, police is highly respected in town and could be met very often in downtown. But only one recommendation, stay safe of pickpockets or thieves. Take care of your wallet if you are in the bus, train and in crowded place. This page was last edited on 21 August 2015, at 21:46.